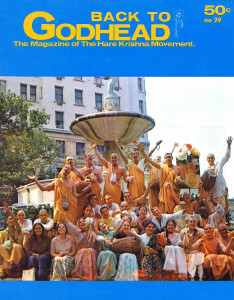 What is The International Society for Krishna Consciousness? The symptoms of spiritual deprivation are the same for everybody in the material world. Consider that we are all subject to birth, disease, old age, and death. We suffer from the three-fold miseries: miseries inflicted upon us by our own minds and bodies, by other living entities (viruses, mosquito bites, wars), and by Nature in the form of hurricanes, floods and other dangers and inconveniences. In addition, we are always imperfect, prone to make mistakes, and illusioned, and our memory is poor. Our senses are blunt and imperfect, we cannot see through a piece of paper a tiny fraction of an inch thick, and at night we are blind without artificial lighting. Any scientist knows that we are capable of perceiving only a minute portion of the known vibratory spectrum of the material world, great areas of which are invisible to our senses and our inventions. A sane man should accept this as the description of the human condition and as the actual plight of his personal self. Failure to recognize this is the work of illusion, and because we are illusioned we make mistakes and cannot be perfect no matter how hard we try. All because we have forgotten God. Spiritual deprivation is forgetfulness of God. This is the only reason that what we see around us is happening at all. What we see around us, this material world, is the embodiment of our forgetfulness. At a time not traceable even in the Vedas, the most ancient of scriptures on this planet, we desired to be imitations of the Supreme Lord. We wanted to lord it over our private domains, and that Supreme Personality of Godhead, infinitely kind in His Love, gave us what we desired. But since such desire to be as powerful as the Supreme was born of illusion, what else could be reaped but another illusion, this material world, this reflection of the Kingdom of God? Because we wanted to forget our relationship with God, He gave us this world in which to live out our forgetfulness. We will remain here until we remember that we are actually His servants and recover our love for Him, our Master. Our personal realization of this is called Krishna Consciousness. We must begin our recovery from the disease of forgetfulness by understanding that we are deprived, mired in this material misfortune, bound in this body by the immutable laws of nature. Can this misery be doubted? Ask any man if he is happy and contented. If he says yes, we automatically do not believe him, because experience teaches us that whatever happiness comes our way is only temporary. Yet it is our illusion, as with the drunk lying in the Bowery and the pig eating stool, to be thinking that we are happy. Or, if we do admit that we are mostly unhappy, we do not know what to do about it. Mention God and we are embarrassed, flying into impersonal and abstract concepts such as “Society,” “moral responsibility,” “existentialism” or some political issue. This instant depersonalization, when the mind refuses to concentrate on thoughts of God, is speculation leading away from our Real Self. Afraid of becoming personal about our real business, we seek shelter in ultimate voidism. The whole cosmic order is under Me. By My Will is it manifested again and again, and by My Will is it annihilated at the end. We are merely the guests of time and space until we start to remember Krishna; then He will allow us a little control and our Self-realization, our Spiritual Life begins. Until that time, a person manufactures his own brand of deprivation—with considerable cooperation, especially from the “psychotherapist” or “psychoanalyst.” It is our misfortune that we can produce no better offer for guidance than these bogus spiritual masters (or the fashionable heir-apparent, the psychedelic guru). Although psychological theories center around deprivation as the primal cause of mental disturbance, the conception is material only. Therefore, any adjustment must necessarily be temporary, and where then is the cure? It is sought in the realignment of our desires. It is said in explanation that our desires are still attached to our parents, and our search for love and happiness will fail because it is still infantile. Therefore we must detach such desire from that parent who never fulfilled it, and re-attach it to someone or even something else which will. Hopefully another woman, a wife or a husband. There are a number of variations on the theme, but the premise is the same: deprived of love we are unable to develop and to give love, and thus we cannot be happy. The skill of the therapist is to manipulate the so-called unconscious desire and to re-attach it consciously to the fulfilling object. Yet still there is the anxiety that always goes with desire, and there is no cure for frustration. All this is only sexual and economic adjustment and is a reflection of the real life taking place right now on the Spiritual Plane, where every living entity is eternally in exchange of love with God. On the material plane, the embodied soul takes all Krishna provides in love for us, but gives nothing in return. Krishna is in love with us, but we are not in love with Him. There is no question of being deprived of God’s love; rather we are in love with our own desires, our minds and bodies. As Swami Bhaktivedanta says, we are merely tasting our own blood. It is a fact that the history of bodies as worked out in ancestry and family relationships, communities, organizations and countries, has nothing to do with us. It all goes on quite automatically, in order to provide us with a particular body, time, and space so that our individual desires can be facilitated. As spirit-soul we are related only to the Supreme, and we are all brothers because our positions are the same although individual: we are the servants of the servants of the servants of servants of servants of the Supreme Personality of Godhead, Sri Krishna. “Relatives” and relativity belong to the material world. The spirit-soul knows no generations, only the transcendental connection between the disciple and his Spiritual Master, and all the Spiritual Masters in the line of Disciplic Succession, all the way up to Krishna Who is the Supreme Guru. There is no other family tree. We are all disturbed by involvement in the turmoil of this material world. Insanity is the condition of the material mind and senses, it is only the matter of degree which remains to be gauged. There are a number of people whom we would all agree are insane, because they hear voices and see things and tell crazy stories. Are they not sleeping? Dreaming? But are we awake, with our private worlds of fantasies and confabulations? Who is crazy? It is only a matter of degree. Obviously, the insane man is the opposite of intelligent. But who is intelligent? Do we know who we are, where we came from, where we are going? Where are the sages who can tell us the meaning of life? Intelligence means how well we know God. Knowledge of the Absolute Truth is the only real knowledge there is. In the final analysis, all misery, all disease, all frustration and dissatisfaction are symptoms of spiritual deprivation because existence in matter is itself this deprivation. The psychiatrist senses this as a separation, a lack of love, but he has no knowledge of love of Godhead. And it is not that God fails to give us His love, for it is always within our hearts, but that we fail to return it. Our anxiety comes from this separation, all other separation is illusion. The love that our parents perhaps never gave us was a love between body and body; it was a thing of identifications, or material attachments between material bodies. Therefore, there is only one problem for all of us, the body. Our problem is that we think that we are this body or matter. That is the only real disease. But we are not this body; we are spirit-soul and our real attachment, our real desire is the Spiritual Love of Godhead. If we love God we automatically love all living entities. We can choose God anytime we want, or we can remain separated and disturbed. The facility for separation is worked out in the arrangement of the immutable laws of Karma which govern the transmigrations of the soul. Karma means that to every action there is a reaction leading to further action-reaction, good for good and bad for bad, continuously involving further commitment and entanglement. The aggregate of these activities, including past lives, determines the type of body we take, birth after birth after birth. Living a miserable life, we take a miserable birth because we get only what we want. Our desire has always been our destiny. Unfortunately, the tendency is often downward: in the Vedas are described lower planets where the only light is provided from jewels in the heads of serpents. There is no end to this samsara, or wheel of birth and death; we have been so engaged since time immemorial. What does the therapist armed with shock treatments and the fantasies of sons and lovers know of this? What does the self-appointed guru think he is doing? Prodding the Supreme Personality of Godhead with a pill? Such is the power of our ancient bad habits. We cannot by such imagination free ourselves. We cannot cure ourselves merely by changing the objects of our material desire because by doing so we remain only on the material plane, this distorted reflection of the Spiritual World. It is a choice we must make: love of God or love of matter. There is no half-way house. As soon as Krishna sees that we are trying to revive our love for Him, He will help us. And just as anxiety goes with desire in the material world, so anxiety will accompany our desire for Krishna Consciousness, but this anxiety has now become an aspect of our transcendental love of Godhead. We must give up the symptoms of spiritual deprivation, and develop the symptoms of God-realization. We can develop these symptoms by thinking about the Supreme Person—His Name, His Fame, His Pastimes. This process of being so engaged in the Goal of all life is called bhakti, or devotional service. The International Society for Krishna Consciousness demonstrates and teaches, under the expert guidance of a Spiritual Master, how to develop a taste for this love of Godhead. By hearing, chanting, remembering, serving, singing, dancing, reading, eating, and telling others, our distorted consciousness becomes purified. It is not that we have to stop our work, whatever it is, but that we have enough faith to chant HARE KRISHNA, HARE KRISHNA, KRISHNA KRISHNA, HARE HARE/HARE RAMA, HARE RAMA, RAMA RAMA, HARE HARE.